Prof. Weller obtained his B.S. degree in Engineering Physics from the University of Tennessee in 1971 and served from 1971 to 1973 as an officer in the United States Navy aboard the USS Constellation . He received his Ph.D. degree in Physics in 1978 from the California Institute of Technology , for the study of ion beam erosion of surfaces, specifically for astrophysical applications. He remained at Caltech until 1979 as a research associate in the W. K. Kellogg Radiation Laboratory. After a brief tenure as a staff member at the Institute for Defense Analyses in Alexandria, Virginia, he returned to academia as an Assistant, and later an Associate Professor of Physics, atYale University . At Yale he was a member of the staff of the A. W. Wright Nuclear Structure Laboratory , where the theme of his research was the application of nuclear techniques to problems in condensed matter and surface physics. 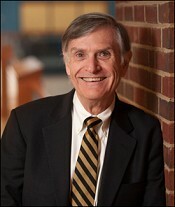 Prof. Weller came to Vanderbilt in 1987 as an Associate Professor of Materials Science and now holds appointments in the Department of Electrical Engineering and Computer Science and theDepartment of Physics and Astronomy . Along with a colleague, he established the Accelerator Laboratory at Vanderbilt, an interdisciplinary laboratory dedicated to the analysis and modification of surfaces and materials by ion beams. He is now affiliated with Vanderbilt’s Institute for Space and Defense Electronics (ISDE). Prof. Weller’s current research interests include radiation effects in materials and electronic devices, ion beam analysis, and the development of techniques for simulating ion beam and other radiation effects in electronics. He has been active in the use of symbolic computation in the classroom and currently teaches courses for engineers in circuit theory, solid state physics, electromagnetism, and scientific computing, as well as a freshman seminar that deals each week with the late-breaking news from all branches of science. With colleagues he holds patents for the development of time-of-flight medium energy backscattering spectrometry and for ion-induced electron emission microscopy.